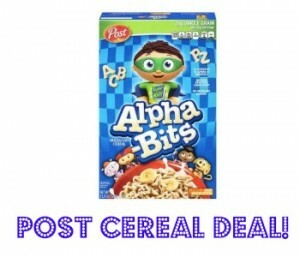 Home > Printable Coupons > Post Coupons | Alpha-Bits Cereal Only 69¢ at Target! Post Coupons | Alpha-Bits Cereal Only 69¢ at Target! These Post coupons have reset! Use a manufacturer coupon and Target coupon below and get Post Alpha-Bits cereal for just 69¢ at Target. This is a good price for stocking up on cereal!